South Barber led Hutchinson Central Christian, 42-26, at halftime of last Friday’s contest. Then, the Chieftains struggled with bad snaps, turnovers and penalties. Central Christian recovered two onside kicks. The Cougars scored 20 straight points and took a 46-42 lead. “We had absolutely zero momentum,” coach Matt Cantrell said. Central Christian threw a deep pass following one of the onside kicks. South Barber senior Cole Coggins, the team’s tallest player at 6-foot-3, picked off the pass. “The momentum just switched like that, and all of a sudden, our offense just click, click, click, click, we went down and tied it there in the fourth quarter,” Cantrell said. South Barber went up 48-46 and had a chance to win the game in regulation. Central Christian drove down the field and threw the ball in the end zone with 14 seconds left. South Barber intercepted the ball but was tackled in the end zone for a safety. The game was tied at 48. The contest eventually ended in a crazy 70-68 three-overtime victory for South Barber. Central Christian scored first in the overtime. Both teams tallied six points in the first extra period and eight in the second. In the first, Central Christian converted the two-point play but had a holding call, and then couldn’t score. In the third, the Cougars scored but couldn’t tally the conversion. South Barber scored and finished with the conversion. Cantrell, a South Barber graduate and former Bethany College player who has served on staff since ‘95, had never coached a three-overtime game before. South Barber, ranked third in the classification, moved to 3-0 and 21-4 since the start of ’16. Two seasons ago, the Chieftains fell 28-0 to Sharon Springs in the second round. Last fall, a banged-up South Barber squad fell 52-6 on the road to Hodgeman County, the eventual state runner-up, again in the second round. Since the summer, Cantrell has been vocal about the Chieftains breaking through for a deeper run. The last two falls, especially 2017, South Barber has not played a difficult strength of schedule and put up gaudy numbers. In the last falls, the Chieftains have an average margin of victory of 33 points game. This season, it’s at 24 a contest. However, South Barber faced a strong Week 1 test versus Cherokee (Okla.) and pulled away late to win 46-26. Cherokee has won its other two contests. Central Christian, known for its offense, is likely South Barber’s biggest hurdle in District 7. In Week 6, South Barber has a highly anticipated matchup versus Otis-Bison, currently fourth in the rankings. Both teams have outstanding quarterbacks with South Barber junior Trevor Rooks and Otis-Bison’s Anton Foust. South Barber’s closer games against quality teams, matchups between Division II powers and quarterback play has driven the first three weeks of the classification – and should continue through the next five. The top-six squads, Hanover, Osborne, South Barber, Otis-Bison, Axtell and Mankato-Rock Hills, all have a standout multi-year starter under center. So far, Osborne and Otis-Bison had competitive losses to Division I stalwarts Hoxie and Victoria. Hanover rolled over an injury-plagued Rock Hills last Friday and gets Axtell in district. Osborne will have 3-0 Northern Valley in districts, one of five unbeatens remaining. South Barber averaged 7.8 yards per play in ’16, 7.5 last year and has dropped to 5.9 thus far against the stronger schedule. The Chieftains, led by Coggins, again have had strong turnover creation in 2018. South Barber has forced nine miscues and is plus-4 in turnover margin. Among western teams, Otis-Bison has averaged 6.8 yards per play, while Osborne has 8.9. South Barber has easily the most turnovers forced among the trio. Last year, Cantrell said Rooks “exceeded my expectations.” This year, he has completed 25 of 48 passes for 388 yards with a 9/2 TD/INT ratio in the spread offense. Rooks has made good decisions, including a TD pass versus Central Christian that came on his third read, a play that impressed Cougar coach Lee Smith. He leads the team with 50 carries for 268 yards and six TDs. South Barber has consistently had strong dual threat quarterbacks under Cantrell with Rooks, Grant Cantrell and Peyton Yandel, a 2015 graduate. Seven years ago, Cantrell switched from defensive coordinator to offensive coordinator for three seasons before he took over as head coach. He heavily focuses on the passing game. In offensive practice, he will throw as much as running. “I really enjoy the spread offense,” he said. Cantrell knew he wanted Yandel as his quarterback. That summer, Cantrell and his family took a trip to Colorado for a week to a place with extremely limited internet and cell phone service. Cantrell developed the offense. Senior Neal Gugelmeyer went over 1,000 rushing yards as a sophomore, was hurt part of his junior season with a Week 6 elbow injury. This fall, he has 143 rushing yards and 47 stops, one off the team-high. Senior Nick Malone has 48 tackles, and junior defensive end Gage Cantrell leads with five TFLs. Malone has gained 20 pounds and moved from end to guard. Junior Zane Lyons has become the starting center/defensive tackle. Freshman Antonio Vasquez starts at guard. Four players have between five and nine catches and all four have at least one receiving TD. Four of Coggins’ five catches have gone for scores. He is tied for the state-best with four interceptions. After finishing as the state runner-up in 8M-I last season, St. Paul was hit hard by graduation. Still, the Indians are off to a solid start having won two straight after a season-opening loss to Sedan. Adam Albertini leads the St. Paul offense and is one of 8M-II’s top players. Other than St. Paul, Southern Coffey County is the only other team in this district with a victory through three weeks. The Titans lone win came in an 84-38 shootout over Hartford in a game postponed to Monday, September 10th due to weather. The Tians host Marmaton Valley this week in a game that should decide the district runner-up. The Wildcats are 0-3 with losses to quality teams in West Elk, Sedan, and Oswego. Altoona-Midway may have its best shot at a playoff qualifier in 26 years. The Jets haven’t been in the state playoffs since a state semifinal run in 1992. Altoona-Midway is giving up 57 points per game, while Colony Crest and Chetopa are surrendering 61 and 50 points per contest, respectively. Centre-Lost Springs and Waverly each pace District 2 having won two of three games to open the season. Waverly opened with a four-touchdown victory against rival Lebo before falling 20-0 to Madison in a muddy Week 2. The Bulldogs rebounded last week with a 30-point win over Southern Coffey County. After dominant wins over Peabody-Burns and Herington to open the season, Centre dropped a 66-28 decision against Canton-Galva last week. The Cougars will be on the road in three of their five district games, but get fellow favorite Waverly at home. Hartford is the only other team in the district with a victory, but the Jaguars have given up 160 points in their two losses. Wakefield’s three losses have come to teams with a combined 7-2 record. Last week, the Bombers fell 30-20 to Goessel. Rural Vista has surrendered 190 points in three games, while Marais des Cygnes Valley has only scored six points all season. Perhaps the strongest district in the class, which isn’t surprising given its comprised of primarily Twin Valley League members. Top-ranked Hanover will grab most of the headlines and rightfully so. The Wildcats have won 28 straight games and back-to-back state titles. Axtell and Frankfort are both unbeaten and have won their first two district games. 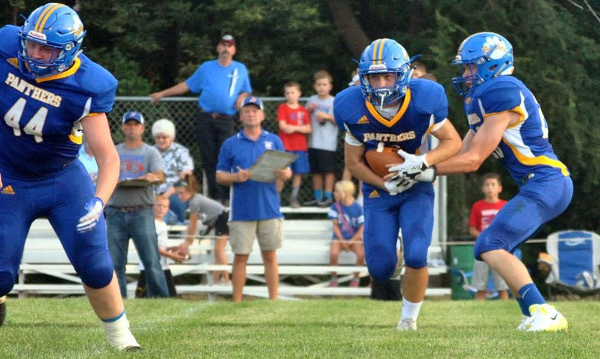 Axtell is getting it done with the passing combination of Quinn Buessing to Hunter Koch, while Frankfort is averaging nearly 200 yards per game on the ground led by junior Garret Dalinghaus. The rest of the district is battling for the fourth playoff spot. Doniphan West’s game against Onaga this week may ultimately decide who claims the fourth spot here in a few weeks. Rock Hills, preseason top-three, has went through a challenging start with Week 1 forfeit victory, a big Week 2 victory and then a tough 68-0 loss at No. 1 Hanover last Friday. The Grizzlies have struggled with injurie to key players, most notably quarterback Dereck Gillett and all-purpose threat Rylee Whelchel. Senior Zane Colson over 200 rushing yards and two scores. Beloit St. John’s-Tipton is on course for its eighth straight winning season. The running game has averaged 177 yards a game, led by 28 carries for 233 yards and five scores for Kail Dubbert. Lakeside-Downs has just 86 rushing yards this season, but senior Caleb Hake has thrown for 237 yards with a 4/5 TD/INT ratio. A 54-38 road win versus Linn marked the Knights’ first victory since before Week 4 since a 3-0 start in 2014. Pike Valley returned one starter and has new coach Jeremy Miller after Don Melby retired after more than 40 years in his hometown. After a 46-0 loss to Hanover, Pike Valley has shutout back-to-back opponents by a combined score of 110-0. Southern Cloud, Linn and Tescott are a combined 0-9 and have struggled with low numbers and/or a late coaching change. Osborne lists just 14 players but has multiple elite players led by brothers Darnell and Darrien Holloway and Kade Miller. The Bulldogs have allowed 150 points but are first in the classification with 176 points. Darnell has 371 passing, 456 rushing and 14 scores accounted for. Darrien has eight total scores, while Miller has five TDs and a team-high 32 tackles. Northern Valley has averaged 6.4 yards per play and more than 53 points a game. The Huskies are off to their best start since ’14 and have captured eight straight regular season victories. Senior quarterback Nick Stutsman has effectively replaced Caden Kinderknecht at quarterback with 260 passing, 288 rushing and eight scores accounted for. Thunder Ridge had three wins in the last three years but opened 2-0 with former Longhorn record-setting running back Joel Struckhoff. Thunder Ridge had back-to-back shutouts before a Week 3 loss to Hill City. Sylvan-Lucas enjoyed a quality Week 3 win versus county rival Lincoln. Beau Batchman had a standout performance with 172 yards and two scores, along with a 63-yard kickoff return. Logan-Palco had posted at least a 4-0 start in the last three seasons but slipped back after significant graduation losses, namely standout running back David Thompson. Sophomore Michael Thompson has stepped in well with 32 carries for 210 yards and four scores. Logan-Palco lists 19 players on the roster, though just four seniors. After back-to-back winning seasons, Wilson is 2-10 since the start of the ’17 school year. The Dragons have 15 players with five seniors. A relatively wide-open district should come down to Dighton and Wallace County, whom the Hornets host in Week 6. Dighton again has a miniscule roster with just nine players, but has multiple quality veterans such as Dalton and Blair Hoffman and David Cramer. Dighton lost to Hodgeman County, ranked in Division I, by 26, beat Oberlin (46-0) and fell at St. Francis, 54-20. Wallace County fell 28-0 to St. Francis in a weather-shortened contest in Week 1, before losses to Leoti-Wichita County (54-6) and Oberlin (24-12). The Wildcats have 15 players, led by senior quarterback Luke Johnson with 145 passing, 196 rushing and three TDs. Wheatland-Grinnell is back up to the eight-man ranks after playing six-man. Freshman quarterback Trey Vincent has thrown for 385 passing yards with a 5/0 TD/INT ratio. Wheatland-Grinnell opened the season with a 46-0 win versus Fairfield. Greeley County was competitive in a 44-18 loss to Hoxie in Week 1, and fell 38-0 to St. Francis in Week 2 followed by a 44-26 victory last week. The Jackrabbits list 15 on the roster. Triplains-Brewster senior quarterback Dakota Esnlow has accounted for 477 yards of offense and four scores. Senior Lane Cheatum leads with five TFLs and has helped the squad force five turnovers. Quinter, down to Division II for the first time, has lost 31 straight contests. South Barber has seized control of this district with a 50-0 Week 2 win versus Fairfield and the 70-68 three-overtime home win against Hutchinson Central Christian. The Chieftains have captured 12 straight district games. Junior quarterback Trevor Rooks leads the offense, while senior Cole Coggins has four receiving TDs and three interceptions. Hutchinson Central Christian went 10-1 last fall with its high-octane offense that averaged a classification-best 64 points a game. Significant graduation losses have dropped that to 44.7 points a contest this fall. Pretty Prairie, under a new coach, has dropped games to a pair of surprise 3-0 teams in Wichita County and Kiowa County. South Haven tallied 22 points in the first two contests before a 48-point effort in a win versus Norwich last week. The victory ended a five-game losing streak dating back to last season. Fairfield ended a 19-game losing skid with a 50-38 home win versus Burrton. The Chargers have dropped 11 straight contests. Norwich has collectively tallied 24 points after a 5-4 mark in ’17. Otis-Bison has remained in the top-five all fall and delivered a strong first three weeks, especially defensively. The Cougars lost 28-14 at rival Victoria, a Division I power, in Week 1. Otis-Bison has posted back-to-back shutouts, including a key home 50-0 win versus Stafford last week. The Cougars have won 11 straight home contests, though get Satanta, Minneola and Ingalls all on the road. Quarterback Anton Foust missed the majority of Week 1 with cramps but has bounced back with 156 passing yards and five scores, along with 279 rushing (10.3 yards per carry) and four TDs. Senior Luke Higgason has three TFLs, while junior Bevan Gradig leads with 23 tackles. Satanta took a big Week 1 loss to Spearville. In the last two seasons, the Indians are 9-1 when they don’t play the Lancers. Senior Gage Salas has had another big season with 463 all-purpose yards, three interceptions and five total TDs. Ingalls has won 20 straight district contests in the last four-plus years. The Bulldogs list 24 players on the roster, including junior quarterback Timothy Gillen, a returning starter, but have just two seniors, led by lineman Benny Hernandez. Stafford has junior quarterback Justice Manning and senior Caleb Hildebrand leading the Trojans. Stafford opened 2-0 for the first time since 2014. Bucklin played powers South Central and Otis-Bison the first two weeks before a 38-6 win against Chase. The Kats have their third head coach in three years and have tallied 18 points in three games. Minneola has also struggled with three losses by the 45-point margin.